Your health depends of being able to make educated dietary choices between good and bad fats. Research has shown that when we taste fat, it stimulates an immediate rise in blood fat levels. Humans can taste fat and we love it. Plants and animals have the wonderful ability to concentrate energy by turning glucose into fats. Gram for gram, fats and oils are twice as dense in calories as carbohydrates and are consequently an effective storehouse ensuring against lean times. Plants store oils in seeds and nuts to provide concentrated energy for a germinating embryo, similar to a yolk sack providing stored energy for a growing unhatched chick. 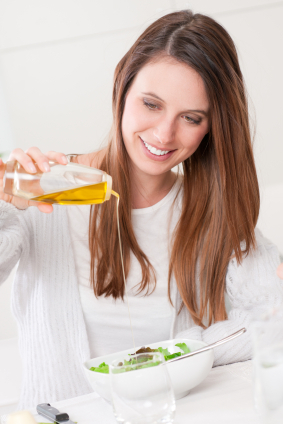 Oils are simply liquid fats that are called lipids. Humans also store excess calories as fat, and with the help of insulin, we can easily convert glucose to body fat. Body fat provides a number of other useful functions: it stores energy in anticipation of famine times, insulates the body for cold days, and cushions vital organs. The body derives caloric energy from fat by breaking down fatty acid carbons that the cells burn within their metabolic furnaces. The byproducts of this combustion are carbon dioxide and water, making fat a much cleaner-burning fuel compared to protein. Nearly all cells in the body can perform fat burning or what is called fatty acid oxidation, but the cells that are best at it are muscle cells. This is why muscles have the reputation of being great “fat furnaces.” It goes without saying that a lifestyle that is deficient in strength-training activities and high in caloric intake can only result in one outcome: obesity. We are going to take a more in-depth look at this in our Exercise chapter. As much as protein is the most controversial of the macronutrients, fat is the most complicated. Some books show diagrams of different fat molecules as a way of giving the readers a better awareness of what they should and should not be consuming. I will avoid such diagrams because if you are anything like me, you will completely lose interest. But my articles will go into a little detail about the structure of healthy and unhealthy fats and there is good reason to do so. I find that knowing why you are doing something is a vital motivator to stay locked in even when the going gets tough. Your health depends of being able to make educated dietary choices between good and bad fats. There are two very different groups of fats that have recently received press time. They are essential fatty acids and trans-fatty acids, the Jekyll and Hyde of fats. At the risk of being overly dramatic, these two groups of fats may have more to do with your physical well-being (or the lack thereof) than any other foods you are eating, so having some understanding of them is important.